The UniFi UVC-G3-FLEX 1080p Network Camera with Night Vision from Ubiquiti Networks uses a 1/3" HDR sensor to capture 1920 x 1080 resolution video at 25 fps. IR LEDs provide night vision functionality. The 3.4mm fixed lens delivers an 87.4° horizontal field of view. Audio recording is possible thanks to a built-in microphone. Integrated PoE technology simplifies connectivity by transferring data and power over one cable. The UniFi mobile app enables camera management and live viewing from your iOS or Android device. 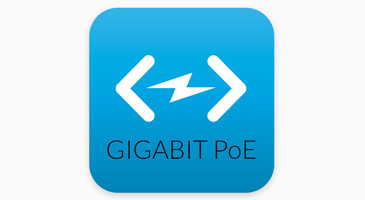 The EdgeSwitch XP delivers reliable passive PoE and Gigabit connectivity to attached Ubiquiti devices and other devices that support passive PoE. Introducing the Advanced Power over Ethernet Switches, EdgeSwitch XP from Ubiquiti Networks. EdgeSwitch XP delivers reliable passive PoE and fast 10/100/1000 Mbps connectivity to attached Ubiquiti devices and other devices that support passive PoE. To connect your PoE devices, simply enable PoE in the easy-touse EdgeSwitch XP Configuration Interface. Each port can be individually configured to provide PoE, so both PoE and non-PoE devices can be connected. EdgeSwitch XP is available in multiple versions to meet your deployment needs. The EdgeSwitch XP supports 24V or 48V passive PoE to power multiple devices on your network. The UniFi NVR with 2TB HDD from Ubiquiti Networks is capable of managing and recording from up to 50 cameras. The NVR is plug-and-play and the setup wizard automatically detects cameras for quick setup. It features the Intel D2550 Processor and 4GB of RAM, as well as a preinstalled 2TB hard drive to allow you to store recorded video. The UniFi NVR readily manages and records video from up to 20 cameras. The UniFi Video software features an advanced UI and extensive feature set, including custom motion detection zones, event recordings, email alerts, live view monitoring, disk management and analytics.